Gayle of And you thought YOU were cranky: Ah Sissy - expanding our minds and reducing our bumsize! What a WOMAN! Greta* of Hooah Wife and Friends: Nothing beats a day with Sissy and Tuck . . . Tiaras will be worn. Jill* of Estate Vaults: Wine or chocolate is always welcome. Laura Lee of The Wide Awake Cafe: Cats are intellectually stimulating. If you don’t believe it, check out Sissy Willis. Mind of Mog: Sissy has a great post up which sums it up rather well complete with Tiny and Babe. Awesome photos as usual. Neo* of neo-neocon: I love those visuals. Patricia -- our blog daughter! -- of Pat's Pond: I love the way you mix punditry, pets and party food! Teresa* of Technicalities: Her father, who comments as Goomp on her site, is just as terrific as I thought he would be. Oh Sissy! what a rare gem this woman is in a sea of gravel. When I first start reading her blog I couldn’t decide if she was an absolute genius or a complete nutcase. She’s a genius no question at all. No one else can match her style or her enthusiasm in blogging. Her cats Baby and Tiny play the role of Forrest Gump and manage to insinuate themselves into 90% of the events unfolding around us and it’s a trip connecting the dots. As we wrote in her comments, "Wow! I can’t wait to tell the administrator of the nuthouse about this. Thank you so much for making my day." Sissy Willis comes from a different part of the conservative tradition than I do, but her political posts are always closely reasoned and well argued, and her sublime naturalist instincts and visual aesthetic sense are always refreshing to encounter online. Plus, the woman loves to cook. #1 on the list of bloggers I've never met in person that I'd like to throw a dinner party with. As Bernie & Phyl would say, "That's nice." *Distaff bloggers who've broken bread with us at Chelsea-by-the-Sea. 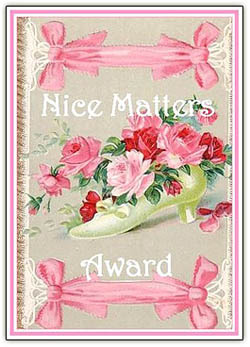 The Nice Award shows it pays to be nice as well as talented. Aw, thanks, Sissy. I look kind of ridiculous in pink anyway... although I do have a few neckties in rather garish pink shades. Congrats on the fine deserved award. Ah. Thanks Sissy. It is indeed a great honor to be included with the wonderful group of very nice (in the truest meaning of the word) bloggers. Sissy Willis writes with more than simply a keen intelligence, but with heart. That is why I check her out many times daily.